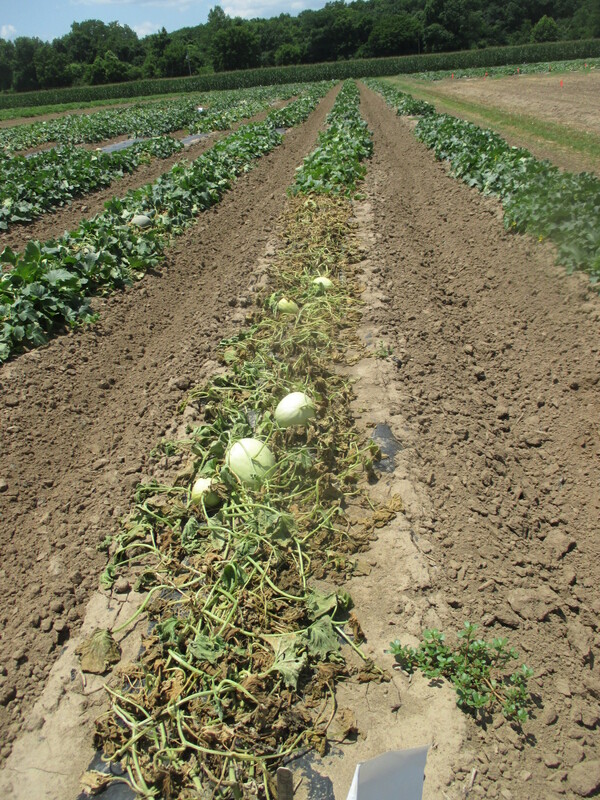 Bacterial wilt is a serious pest of cucumbers and melons. This disease is caused by the bacterium, Erwinia tracheiphila. However, it is spread by the striped or spotted cucumber beetle. Most management schemes have concentrated on controlling the cucumber beetle in order to lessen the severity of bacterial wilt. Currently, management of bacterial wilt often takes the form of a soil applied systemic insecticide such as Admire Pro® at transplanting and follow up pyrethroid products applied foliarly about 3 weeks post transplanting. The pyrethroid applications are made when the 1 beetle per plant threshold is met. 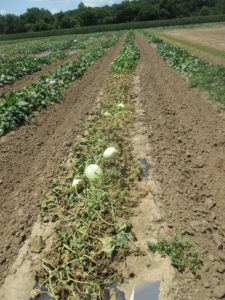 Every year, there is a melon variety trial at the Southwest Purdue Agriculture Center in Vincennes, IN. In 2018, the trial included several specialty melon varieties. We noticed more bacterial wilt than usual (Figure 1). Therefore, we decided to rate the varieties to see if there were any differences in susceptibility. Figure 1. A melon cultivar that was severely affected by bacterial wilt. 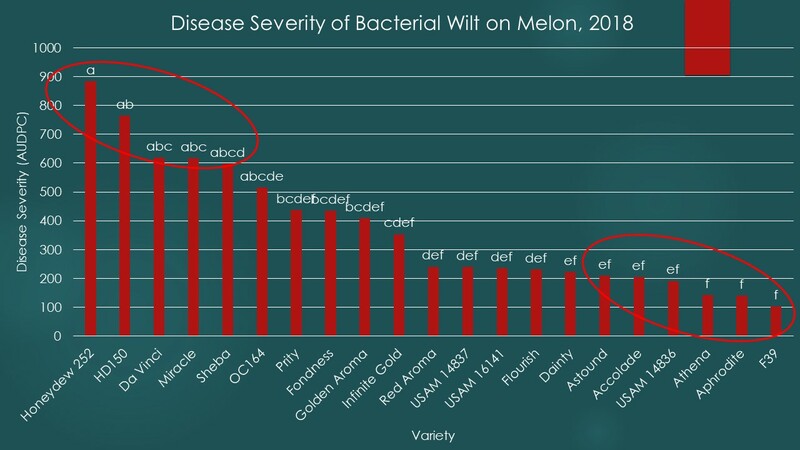 Figure 2 shows the result of the bacterial wilt evaluation of melon varieties in the 2018 season. Among the most susceptible cultivars, Honeydew 252, and HD150 are honeydew melons; Da Vinci is a Tuscan type melon; Miracle is a netted yellow-green fresh melon; and Sheba is a netted green fresh melon. Among the most tolerant cultivars, F39 is a western shipper cantaloupe; USAM 14836 is a Harper melon; Aphrodite, Athena, Astound and Accolade are eastern cantaloupes. It appears that the management method that we used for the cucumber beetle and bacterial wilt was satisfactory for standard cantaloupe varieties. However, the methods we used were not adequate for some of the specialty melons. Let’s look at our management methods in detail. Figure 2. 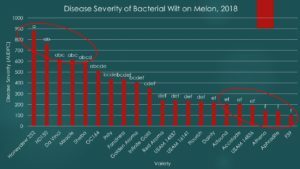 Disease severity of bacterial wilt on melon cultivars. We used Admire Pro® at 4.3 fl. oz per acre as a transplant drench. More about that rate later. A flush of striped cucumber beetles was observed at the end of May. In response, we applied Permethrin® at 8 fl. oz. per acre and Warrior® at 1.25 fl. oz. per acre on 1 June and 14 June, respectively. Recall that while Admire Pro® will help to manage cucumber beetles initially, if cucumber beetles are present in sufficient numbers (the threshold for cucumber beetles on cantaloupe is 1 beetle per plant) 2 to 3 weeks after application of Admire Pro®, foliar applications of insecticides to manage cucumber beetles may be required. Bacterial wilt was observed in mid-June. Admire Pro® is labeled as a soil drench for striped cucumber beetles at 7 to 10 fl. oz. per acre. Note that we accidentally applied the wrong rate of Admire Pro®. Nevertheless, this low rate, in combination with the foliar applications of insecticides was sufficient to control bacterial wilt on standard cantaloupe varieties. Purdue entomology recommends the low rate, 7 fl. oz per acre, for control of cucumber beetles and bacterial wilt on cantaloupe. We are not recommending the 4.3 fl. oz rate. However, these results confirm research by Purdue entomology that it is not necessary to apply the high rate of Admire Pro® to control these pests. In fact, the high rate is more likely to result in bee death. The specialty melon varieties grown in our trial appear to be more susceptible than standard western shipper or eastern cantaloupe varieties. Therefore, management of bacterial wilt of specialty melons may take more care.